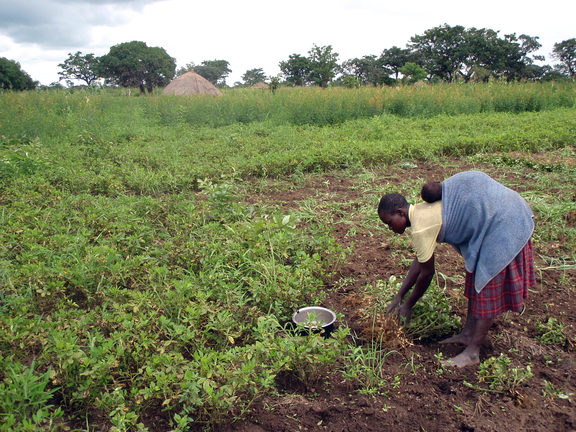 As opportunity grows in northern Uganda after 20 years of violent conflict, farmers are building back and reinvesting in the land. But a lack of tractors could keep the region hungry. A two-decade war between the Government of Uganda and the fanatic religious leader Joseph Kony and his Lord’s Resistance Army has staggered development in Uganda’s Acholi region. As hundreds of thousands of farmers waited in aid camps during the worst years, land was left fallow and an agriculturally-based economy destroyed. With the closure of camps and a growing peace, farmers have begun to return and resettle. Farmers have also begun to invest again in their futures, helping to reclaim the region’s previous distinction as the breadbasket of Uganda. But it’s been years since there was a demand for tractors and tillage services for the land. Local auto mechanics can’t fix tractors and few hardware stores carry the needed parts. Worse yet, tractor companies and banks still see the region as a humanitarian zone not worthy of investment. Today, in an area that encompasses about 28,500 square kilometers with more than 700,000 people—most of whom consider farming their primary occupation—there are 29 tractors. Only about half work. World Bank figures estimate that neighboring Kenya has about 27 tractors per 100 kilometers of arable land. The world’s average? 195. Clearly, farmers resettling in a post-conflict region face severe constraints to modernizing agriculture and selling high-quality produce. Better quality seeds, good information about fertilizer, improved post-harvest handling practices and storage options, and banking services are just some of the needs. The lack of tractors and tillage options, though, may be one of the greatest hurdles. As a fledgling economy begins to get legs, traditional humanitarian responses, like giving away tractors, can severely distort the market, making a strong comeback harder and harder to achieve. Mercy Corps is approaching the hunger problem with a business-driven solution. With funding from the U.S. Department of Agriculture, USAID and in partnership with Technoserve, the team is using a facilitative development approach called “Making Markets Work for the Poor.” It involves determining critical, systemic constraints to market growth and identifying local players who might already be filling gaps, but perhaps not to the extent needed to make a long-term dent on hunger. From there, the approach involves improving the effectiveness of existing players and developing partnerships between them, and then stepping back. Mercy Corps is demonstrating to key players—tractor companies, hardware stores, mechanics, banks and the farmers themselves—that there already exists a strong business case to stimulate the tractor market in this neglected region. Kampala-based Engineering Solutions Ltd. (ENGSOL), a large supplier of tractors and agricultural implements, has established a local dealer and is building up the proficiency of local mechanics and stocking stores with product lines, making high-quality tractor parts and skilled service providers available locally. They’re also investing in tractor operators’ plowing skills and tractor knowledge, helping to build trust and a long-term client base for the company. Rather than part of a charitable activity, ENGSOL sees this as an opportunity to expand their business over the long-term. Farmers, whose entrepreneurial spirit eroded during the years of conflict and charity handouts, must also be convinced. Rather than loaning a tractor to friends in exchange for paying school fees, tractor owners must see that renting out their machine is a viable business. Crucial to success is whether farmers with tractor-tillage businesses see the incredible demand in the region and learn how to tap it. Mercy Corps is working with existing community knowledge workers and agents from private sector companies that supply farming inputs to turn them into part-time matchmakers: As they travel throughout the region giving agriculture advice or selling seeds, they’ll also document who needs tillage services. For a fee the agents and farmers negotiated—2,000 shillings, or about 77 cents an acre—they’ll aggregate demand and ensure the fields to be plowed are measured and properly cleared, making it worth the tractor owner’s travel and time. Radio spots and posters in central locations will also alert farmers to the newly available and affordable tillage services. Fundamentally, tractor-tillage businesses have to change their practices to begin keeping track of how much fuel is used per acre and how often the oil should be changed, for example, so they can price out fees and build a scalable commercial endeavor. To support this, Mercy Corps is also providing vital business advisory services, helping these tiny tractor businesses build and test new commercial models and practices to see if they are viable and scalable. The goal is reinvestment – with returns, these businesses will be able to buy more tractors, till more land and help more small-holder farmers grow higher-quality food. The current hurdle is convincing risk-averse banks that the tractor-for-hire business is a viable investment and worthy of a loan, without which tractor owners can’t repair worn out machines or buy another to expand their services. Banks in Uganda charge interest upwards of 30 percent and rarely offer flexible payback schedules, impossible for a farmer whose income is tied to the harvest schedule. However, even with strict financing terms, the demand for tillage is so high and the supply of tractors is so low that a business could pay back the investment in less than 2 years. Mercy Corps has been working with banks to develop farmer-friendly financing instruments, and assisted an initial group of nine tractor owners, whittled down from 46 initial applicants, to apply for a loan. Only one has received tractor financing so far. Though the pilot project aims to improve the food security of 15,000 farmers in the first three years, through September 2014, the approach aims to build stiffer competition among the business community to meet the needs of previously neglected areas. In the end, it’s about connecting farmers and their families with the tools and resources they need to improve their lives. This post was originally published on Mercy Corps’ Global Envision blog. It is republished with permission.